For our patients from Plano, Allen, and other surrounding communities, we offer a variety of tooth replacement solutions. However, dental implant supported tooth replacement is the only solution that allows us to repair the entire lost tooth both roots and crowns. For those who choose this tooth replacement option, Dr. Bunday works with a team of specialists to place and restore dental implants. 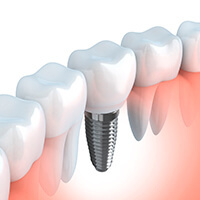 Your dental implant begins with the surgical insertion of a titanium implant post into your jawbone, which is completed by a trusted local oral surgeon or other specialist. Over the course of three to six months, the dental implant post fuses with the jaw bone. Once the bone fuses to the post and heals, Dr. Bunday will attach a tooth replacement restoration to replace one tooth or a full arch. Patients missing a single tooth will need have a dental crown attached to a single crown. In some cases, two consecutive missing teeth can also be replaced with a single implant that supports two crowns that are fused together. Patients missing three or four consecutive teeth can have a fixed bridge supported by a dental crown at each end of the restoration. For more extensive tooth loss, we’ll likely recommend dental implant supported partial or full dentures. Partials are used to fit between remaining healthy teeth and restore oral health. Full dentures are used to restore an entire arch of missing teeth. Typically, partial or full dentures can be supported with four to six strategically placed dental implant posts. Dental implants can give you plenty of reasons to smile again! Dental implants give you proper bite proportion, return functionality, allow normal speaking and eating, strengthen your jawbone, and ensure oral health.